Tye says that he filed an internal complaint with the State Department's Inspector General (and with the NSA's Inspector General), noting that collecting information on Americans via 12333 (again, which has no oversight in Congress) violated the 4th Amendment. Note that nothing appears to have happened because of this. The Privacy and Civil Liberties Oversight Board (PCLOB) targeted 12333 for investigation soon after Tye's revelations, but no report was ever produced. The PCLOB is effectively dead for now, and with it, everything it had researched on 12333. Notably, the surveillance state supporters in Congress last year tried to kneecap the PCLOB to stop it from investigating 12333 (that effort failed, but with the PCLOB on life support it may not matter). Just a few months ago, Senator Ron Wyden put out another Wyden Siren, asking the intelligence community to state how many Americans had been targeted under 12333. As per usual, when Wyden sends such a letter, a big part of it is alerting the American public to the fact that the intelligence community is up to no good and trying to hide it. Wyden's letter certainly suggested that 12333 was being widely abused to spy on Americans, despite its supposed focus on surveillance overseas. And now, Human Rights Watch has released some documents, obtained via a FOIA request, showing that the Defense Department modified its policy to allow using 12333 to spy on Americans without a warrant, so long as the US government designated them as "homegrown violent extremists" -- whatever that means. Newly released documents reveal a US Defense Department policy that appears to authorize warrantless monitoring of US citizens and green-card holders whom the executive branch regards as “homegrown violent extremists,” Human Rights Watch said today. Separately, the documents also reinforce concerns that the government may be gathering very large amounts of data about US citizens and others without warrants. Both issues relate to a longstanding executive order that is shrouded in secrecy and should be a focus of congressional inquiry. 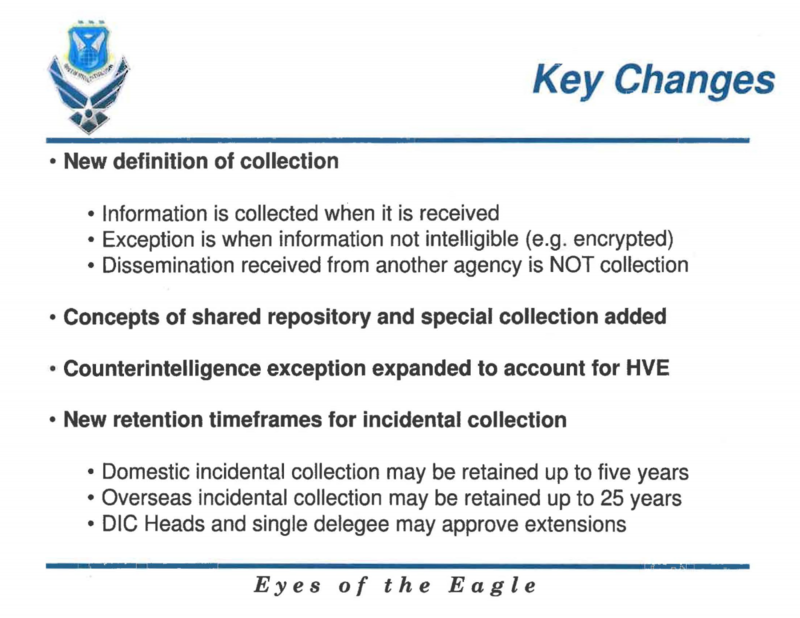 In indicating that this category includes “HVEs,” the training document depicts this expansion of the “counterintelligence” collection definition as a “[k]ey” change in the new procedures. The document indicates that the change allows the collection of intelligence on US persons even in the absence of a “specific connection to foreign terrorist(s).” As examples, it alludes to the individuals who carried out mass shootings in San Bernardino, California in 2015, and in Orlando, Florida in 2016. The Defense Department’s methods and criteria for identifying “homegrown violent extremists” remain unclear, raising fears that the designation could be applied in ways that are arbitrary, inconsistent, or discriminatory. It is also unknown whether US persons who merely exercise their free-expression rights by visiting a controversial website, espousing certain political or religious views, or criticizing the government might be targeted. The government also has not yet disclosed its legal justification for this policy, especially insofar as it involves any warrantless monitoring of US persons that would normally require a warrant under the Foreign Intelligence Surveillance Act, other statutes, or Fourth Amendment case law. The government should fully disclose the policy, its legal underpinnings, the type(s) of monitoring to which it may lead, and its anticipated and actual application. 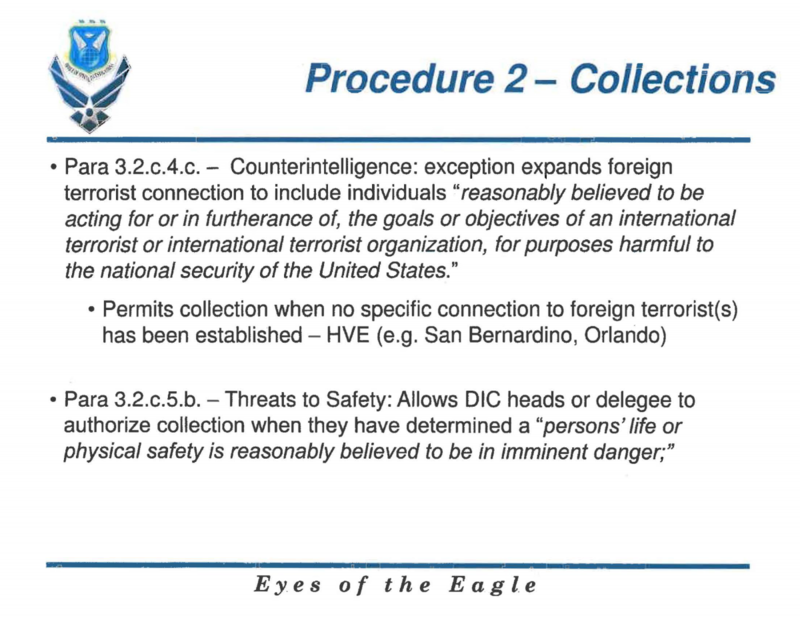 As you can see in the released documents, the "counterintelligence exception" has been "expanded" to cover those "homegrown violent extremists" and cites San Bernardino and Orlando as an excuse for this. Note how our surveillance policies apparently changed without any public discussion or debate and via a program that has no direct Congressional oversight. And, on top of that, on an issue that clearly has direct Constitutional issues. It's no secret that the NSA and others will push and stretch interpretations to increase surveillance activities, but here's a case where it seems like they are blatantly trying to skate by while ignoring that the 4th Amendment even exists. "homegrown violent extremists" -- whatever that means. I would be that violent shouting in protest is enough to qualify someone. You better believe it. Because the regime knows full well that its greatest enemies are not terrorists from overseas, but disaffected citizens at home. After all these years, this should not be a surprise to anyone. All the controversy, all the breaches of Constitution and law, stem from the government's desperate preoccupation with spying on its citizens. None of that is needed for surveilling enemies overseas: they have no rights. Homegrown -- from within our borders. Violent -- uses threat or use of violence to accomplish goals, often just possesses weapons, since capability is routinely read as intent by our government. Extremist -- Anyone who advocates disobeying the law as a means of pursuing any political or religious ideology. The thing they can't (or refuse) to see is that they themselves tick all of the boxes to be a Homegrown Violent Extremist -- violating the Constitution makes them extremist, carrying guns and fearing for their lives at the flimsiest excuse makes them violent, and they're all US citizens. "ignoring that the 4th Amendment even exists"
It may as well not. Get a *F*** WARRANT, ALWAYS! The boundaries of what's foreign and what's domestic are getting really fuzzy, what with the internet and all basically ignoring national borders. Our constitution doesn't make a distinction between citizens and noncitizens, between domestic and international. I wonder why not? It's hard to know who you are really targeting anymore. Spying, any kind of spying, should require a warrant. Full stop. If you can't get a judge to sign off, you shouldn't be doing it. Re: Get a *F*** WARRANT, ALWAYS! 2) Share all data with foreign nations covered under agreements. 1) Make sure all data passes through foreign nations (how... by applying liability for data in the US causing companies to offshore their data). It it's not already happening, it will be soon. I know that the cynical among you already assume -- falsely -- that the surveillance state ignores all rules and spies willy nilly on everyone. That is not true. Maybe not but the public can be forgiven for simply assuming it to be true since we have no way to gauge when we are or are not being spied upon. With all the news coming out these days, this article included, it's not even cynical to think this way. "...enabled much greater surveillance oversees"
This is how the terrorists win. They work for the enemy too; they just don’t know that they’re working for the enemy. Similar to those soldiers still fighting—not yet knowing that the war has already ended. They're not in the habit of talking to criminal judges. This seems like a job for the FBI, not the military. There seems like there should be some posse comitatus issues involved here as well. The DOD might not talk to criminal judges, but there's no time like the present to turn a new leaf! The surveillance state operates completely outside the rules and only the ignorant/uninitiated believe otherwise. New reporting by the Guardian reveals an NSA program called XKeyscore gives the agency near limitless access to e-mails, Web browser history, social media activity and more. The program contains few checks to ensure the surveillance complies with US law. One of the program's limitations mentioned several times in the presentation is the massive volume of data it collects. The Guardian report notes that for a single 30-day period in 2012, there were at least 41 billion records that were gathered and stored in XKeyscore. "Content" like e-mails and browser history is stored for between three and five days, the Guardian reports, while "metadata" can be stored for up to 30 days. The newspaper also describes a tiered system of data storage that allows the NSA to move especially "interesting" content onto other databases that store the data for longer. According to an internal agency newsletter, in 2011 AT&T began handing the NSA more than 1.1 billion domestic cellphone calling records per day, following "a push to get this flow operational prior to the tenth anniversary of 9/11," referring to the September 11, 2001 attacks on the United States. A person familiar with the matter told USA Today that the agency's goal was "to create a database of every call ever made" within the nation's borders. All of this was done without a warrant or any judicial oversight. Second, the same telecommunications companies also allowed the NSA to install sophisticated communications surveillance equipment in secret rooms at key telecommunications facilities around the country. This equipment gave the NSA unfettered access to large streams of domestic and international communications in real time—what amounted to at least 1.7 billion emails a day, according to the Washington Post. The NSA could then data mine and analyze this traffic for suspicious key words, patterns and connections. Again, all of this was done without a warrant in violation of federal law and the Constitution. In a declaration in our lawsuit, thirty-year NSA veteran William Binney estimates that “NSA installed no few than ten and possibly in excess of twenty intercept centers within the United States.” Binney also estimates NSA has collected “between 15 and 20 trillion” transactions over the past 11 years. You are absolutely right the US government would never tell a lie (HaHa the jokes on us). Every last bit of digital data you, I or anyone else has ever transmitted via email, fax, cell phone conversation (etal) has been collected and is being stored in one of NSA's many data repositories around the world. And we have not even touched on the use of the US governments surveillance partners known as Five Eyes which allows NSA to circumvent the Bill of Rights by pretending a foreign entity is collecting the data. And perhaps you're correct -- but it's hard to see why law enforcement can't obey the 4th Amendment and get a freaking warrant out in such cases. 1) Create a paper trail that might be 'inconvenient' if a judge decides to look into the matter. 2) Require more than a hunch/whim/'Why the hell not?' to present to a judge to get. It's not 'hard to see at all', you just need to not give them the benefit of the doubt when it comes to wondering why they can't/have no interest in meeting such a low bar. No, its the Russians who are spying and manipulating Americans. Stop this treasonous propaganda. Redefining anything they obtained from another agency as "not collection". Easy way out of any accusation of "correcting too much data": "we didn't collect it, was graciously handed to us by a friend." But seriously, how much can they stretch definitions when "homegrown" becomes included in "foreign"? At this stage, like another commenter stated it above, there might still be rules to private data connection, but you can basically assume there are none from a normal person's point of view. If the information is being handed over by another agency, that other agency must have already collected it, so collection already took place before the point where this agency receives it. As long as the other agency also adheres to similar definitions of what constitutes collection, this part of it all holds together just fine. It's just that that condition may be too much to hope for. "But but but," protested MyNameHere, "people put personal information on social media all the time! You're not allowed to blame the Defense Department, you're just not!" To be fair, people were never taught or encouraged to only post things online that they'd share with anyone. Facebook encouraged this kind of "freely uncensored online self" culture right from the get-go when it was the first online service that used your real name instead of encouraging pseudonyms as identifiers. The early Internet culture was one of pseudonyms and caution. The new rules made the old guard of the early Internet seem "uncool" by comparison, and we wouldn't want to be uncool by not ponying up our real data, right? More than three years old article is probably outdated..
the upper management and generals know who they are defending, and that is the government. The question may come down to who are the soldiers defending. I know that the cynical among you already assume -- falsely -- that the surveillance state ignores all rules and spies willy nilly on everyone. Falsely? LOL. Thats a good one Mike, almost got me there. They are not only spying, stalking, tracking innocent Americans they are torturing and experimenting on us with sonic, microwave, energy weapons using these executive orders to get by with it. My mother and I have been tortured since 2010 as well as many others. We have never committed a crime or have any connections to terrorist groups and certainly would not harm anyone. The only thing I am guilty of is not agreeing with Obama's socialist, one world nation take over. Anyone that speaks out against their evil agenda and the police state we are in, are labeled a "domestic terrorist". They send out false info on the police fusion centers about us and then local law enforcement and their paid neighborhood watchers track and torture us. They are using the cellphone towers and cell phones to track and torture. The ultimate goal is mind control of the entire nation by the government...we will all become mindless slaves to them, by sound waves being emitted from these towers and our own cellphones. Please go to website everyday concerned citizens and read the memo to President Trump for more info. Please read all the comments from the tortured victims also. The victims are mostly Christians Conservatives, Patriots, Vets, white and women. Women are easy targets for them....all 80% of us. Its estimated over a million innocent Americans, including children, are currently being tortured and experimented on. Please speak out and stop these surveillance acts. innocent woman profiled incorrectly; abused again! I have been absolutely, 100% toyed with psychically; in the most heinous, repeat all my thoughts 24-hrs. a day for the past 4 f-in years!!! I hate telepathy, and guess who!.. some man finally 'came through' and gave me the finger back and said "It's a machine in Washington," (meaning DC I think)but it never quits. I don't need medicine, a pshrink, likely unable to hire my own p.i. for a while. This is cruel. I used to tell people about occasional psy incidents. Wish I didn't. This is as simple as having a good Samaritan flip the switch off. China does this sadly, too?